2) the increasing unrest in the Bangladeshi garment industry and state measures to contain it. To be "crossfired" has since become a common term for police assassination in Bangladesh. Six of the deaths in custody - of fit and healthy professional soldiers - are reported as heart attacks, six due to other diseases and four as suicides. In response to the reaction to these deaths, the BDR issued an absurd press release on Wednesday stating: "BDR authorities instructed all its units to motivate jawans [soldiers] not to commit suicide." One suspect has stated in a remand court appearance that he has been tortured during interrogation. In the unlikely event the suicides really were genuine and undertaken as a merciful release from torture in custody, then presumably the above instruction is a military order resenting this final act of indiscipline - as always, an army wants to control exactly why, when and how its soldiers die. A BDR Major General told the BBC "We believe that perhaps they have failed to cope with the mental pressure associated with the guilt of committing the brutal attacks. Suicide is seen as a sin in religious terms and is also socially undesirable." The full story of who planned the mutiny may never be made public - it is in the interests of various rival interests to blame other parties and write history accordingly - and the official accounts can be trusted about as much as the 'explanations' of the 'suicides' in custody. But it remains likely that Islamic fundamentalists manipulated genuine greivances of rank'n'file soldiers so as to launch an attempted offensive against the more secular newly elected government. That such greivances were significant is given more plausibility by the Army's announcement of promised improvements in BDR pay and conditions and easier promotion prospects. Meanwhile, Bangladeshi garment workers are once again expressing growing anger at their miserable conditions. A recent government report has confirmed that workers in Bangladeshi export industries continue to be paid the lowest wages in the world. Bangladeshi workers in factories involved in leather processing, shoe making, jute yarn manufacturing, shrimp processing and production of medicines receive the world’s lowest wages. The average monthly wages of Bangladeshi garment factory workers is even less than one-third of the global average, in spite of the fact that the high-quality stitching by Bangladesh’s female workers pleases overseas buyers. A recent global survey of the world’s garment industries by the US-based consulting house, the Jassin-O’Rourke Group, shows that a Bangladeshi garment worker gets only 22 US cents per hour. ‘On average the garment factory workers’ wages in Bangladesh are extremely low,’ acknowledged a senior executive of a US-based buying house stationed in Dhaka. So if labour power is cheap enough, lower productivity is still competitive. But as the credit crunch hits harder, there has been a gradual decline in orders from Western buyers across Asia's ready made garment (RMG) industry. As companies get more desperate and the market competition more ruthless, the common problem of RMG workers often failing to receive wages in full or part gets even worse. With unemployment set to grow fast, state and bosses are preparing for unrest. Through April there have been dozens of incidents in RMG factories; "‘We are sensing growing anger among the workers against non-implementation of the tripartite agreement,’ said Syed Sultan Uddin Ahmed, executive director of the Bangladesh Institute of Labour Studies said." The tripartite agreement was made in the aftermath of the major RMG revolt of 2006 (see; http://libcom.org/news/article.php/bangladesh-garment-revolt-140706) when hundreds of factories were attacked and burned. The deal promised improvements in pay and conditions and trade union rights but these have only been partially implemented in a minority of workplaces. 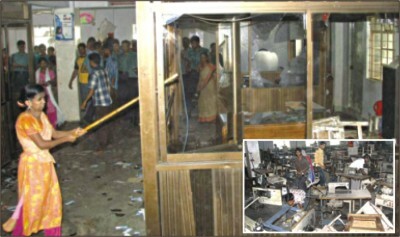 One of many recent examples of workers' anger; last week workers at Northern Apparel Ltd, Chittagong, trashed the factory in protest at repeated non-payment of wages. On Thurs 23rd, after bosses for the third time this month failed to pay arrears, the mainly female workforce became enraged. They had turned up to the factory expecting payment, only to find no wages and that bosses had called in police to the factory premises. Police and management could only watch as over 200 furious workers began systematically wrecking sewing machines and offices. The wrecking continued periodically from 8am to 1.30pm. The workers said they were facing acute financial crisis as the factory authority had been making such delay persistently every month for last two years. Sanwara Begum, 30, single-mother of an eight-year-old daughter and a sewing operator of the factory for two years, said she had to vacate her house as she failed to pay rent. Rajab Ali, 18, another sewing operator, said he had been staying at one of his friend's shanty as his house-owner forced him out for the same reason. Showing his injured hand Sohel, a quality control worker, alleged that some factory officials beat him on April 20 when he demanded his arrears. MD of the factory Nazmul Hossain told The Daily Star that he incurred a loss of Tk 70 lakh in March 2008 as one of his buyers cancelled its order. He is still struggling and trying to recover the loss, he added. Nazmul said they had also lost few more contracts recently as they failed to meet the delivery deadline due to acute power shortage in Chittagong. The MD burst into tears watching the workers vandalising his valuable machineries. With normal conditions of the Bangladeshi working class being often a precarious hand-to-mouth existence, the credit crisis may soon hit the industry like a social and economic tsunami - so preparations for worker unrest are under way. Some politicians, NGO's and unionists have now called for a hardship fund to be set up to distribute rations to un- and under-employed garment workers. As a cheaper alternative to increasing wages, RMG bosses and government have periodically organised subsidised food ration distribution to the workforce. That is the measly bare subsistence carrot; the stick is the organising of a new industrial police force. The RMG employers federation, the BGMEA, has long been lobbying the government for such a force. The Ansar paramilitary auxiliary forces and BDR are already called in as necessary to help in policing workers' demonstrations and strikes; the new force will presumably bring a permanent paramilitary presence to the industrial zones. It is hard to know just how much impact the present economic downturn will have on the RMG sector and other industries. 'Remittance payments' - money sent home to dependents by workers abroad - accounts for almost as much income as is earned by RMG sales, and thousands of laid off emigrant workers are now returning from elsewhere in Asia and from the Middle East to face unemployment at home. So with 2.5 million predominantly female garment workers facing increasing desperation, as are much of the wider Bangladeshi population, one can only expect an increase in class struggle across the country from those being paid "the lowest wages in the world". Keep these articles coming - I look forward to them.